Autokick on traffic lights violation. Suggestion name: Autokick players who violate traffic lights. Suggestion description: Basically auto-kick all players who violate red traffic lights. Examples: No example. Why should it be added? : Because I'm tired of players ramming when I'm clear to go on a cross-over. 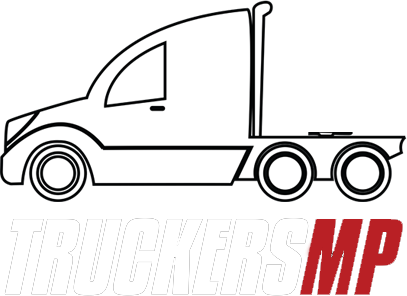 Why wouldn't SCS want to work with TruckersMP? This topic probably has been discussed already but imagine all the possibilities if SCS and TruckersMP decided to work together. Are there any problems (financially, rules,...) regarding a partnership? Do SCS or TMP not care? I'm pretty sure TMP is the cause of the popularity of the game and oh SCS better realise that. I only play mp because sp is just way too boring, even if you don't get rammed in sp, and I'm not only one here thinking the same. There's probably a good reason to it and maybe I'm not getting it. What radio do you most listen to on the ETS2 MP? Q-Music, It's a Belgian radio station. Songs are pretty good. Krone ugly grey texture when DLC not bought. Suggestion name: Delete ugly 'krone' textures when the DLC is not bought. Description: Is it possible to replace the grey textures with 'buy Krone DLC' to just a plane white texture? I also don't see the point to buy the DLC. Examples: No particular example. Why should it be added? It's quite ugly to see the grey tires and trailers. I've got a suggestion where everybody could benefit from. Suggestion Name: Behavior rating system. Description: Some sort of a rating system based on your behavior and amount of kicks or bans in the last 5 months or so. The color of your name would change depending on your rating or next to your name you have a number, from 0-100, again depending on your behavior. A ban would severely decrease your rating. Kicks would just lower the rating just a small bit. Admins can always change your rating. Even your behavior on the community and forums could change your rating. Example: Erm, something like this? (My player-tag + name + rating) 90KPH Belgica BE - Sevasta-Star <100> 90KPH Belgica BE - Sevasta-Star <25> Or with colors (I know admins have red names): 90KPH Belgica BE - Sevasta-Star (Bad Rating) 90KPH Belgica BE - Sevasta-Star (Low Rating) 90KPH Belgica BE - Sevasta-Star (Good Rating) I guess the the tag-coloring feature should be deleted or it would be a color-mess. But why though? Like I said, I think everybody would benefit from this system. This would warn us that we should keep some distance from those players. Game admins could also benefit from this. They have some feedback on those players on how they played in the past so that admins can give a good punishment. If you got a bad rating, higher punishment, if you got a good rating a reasonable punishment. Good feedback is welcome .